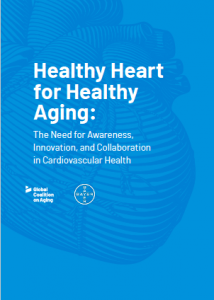 The report highlights the current momentum from the global health community that makes now the opportune time to advance a healthy aging agenda for cardiovascular diseases. The report calls for specific policy actions that will advance ongoing innovation and engage a wide range of stakeholders. With over 17 million deaths worldwide, CVDs are the largest noncommunicable disease (NCD) by morbidity and mortality. From 1990 to 2016, the number of global, annual CVD deaths increased by more than 40% – from around 12 million to over 17 million – increasing CVDs’ share of total mortality from 27% to 32% of all deaths. CVDs impose an immense burden on individuals and health systems, due to the costs of the diseases and their comorbidities. Yet too often, these diseases are misunderstood as a natural condition of becoming old when in fact proactive attention to prevention, treatments, and care can change the incidence and prevalence of these conditions regardless of age. Awareness: Meaningful policy action on CVDs must promote awareness and education amongst the public, patients, caregivers, and healthcare professionals to empower healthy choices that reduce risk for CVDs and related health challenges. Innovation: Policy-makers must recognize that innovation moves primarily through incremental advances, so we must accept a research paradigm aligned with this stepwise progression. Collaboration: Effectively addressing the direct and indirect impacts of CVDs will require policies and platforms that engage a wide range of actors, including government agencies, health systems, the private sector, non-profits, multilateral organizations, and advocacy groups. In recent years, leading global, multilateral, and national institutions and health policy decision-makers – including the WHO, OECD, G20, governments, and others – have recognized the need to address the growing health and economic challenges related to population aging. Landmark public policy initiatives, like WHO’s Decade of Healthy Ageing and the G20 Principles on Silver Economy and Active Aging, have generated global momentum for successful aging. Now, policy-makers must continue this momentum to establish frameworks, programs, and collaborations that realize a sustainable course for healthy and active aging, and CVDs require urgent attention.